Join Anne, Renata, the amazing Beth Darlington AND the truly awesome "Do U Believe Paranormal Research Team" at The Imperial Hotel Ravenswood, for a day of workshops, an overnight investigation, bed for the night, Dinner AND breakfast the next morning....and a whole heap of fun! WHAT A BARGIN! Weekend of workshops, friendship, learning, Paranormal Investigating and maybe a little bit of fun to boot! 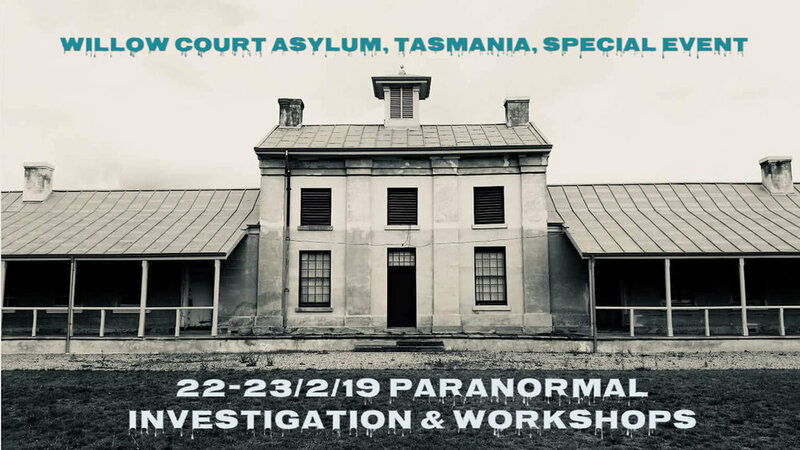 Tasmania's Most Haunted has invited three of Australia's leading ladies of the Paranormal to run workshops AND Investigations alongside the TMH team. 22/2/19 Friday Evening Three hour investigation at Willow Court Asylum "The Ladies Cottage" and "The Morgue"
"Q & A session" with Beth, Renata, Anne and Tasmania's Most Haunted Team. 23/2/19 Saturday Evening Four Hour investigation at Willow Court DARK ASYLUM. "Frascati" and "The Barracks"
"The Lot" investigations both nights and the workshop. Renata Daniel: Renata runs the multi award winning "Newcastle Ghost Tours". She is an author, teacher, medium and role model in the field. Recently she has started a new venture "Secret Witch Business" inspiring people to be the best they can be. Renata has been teaching mediumship for 20 years and is one of the Seance Sistas (The Seance Parlor) and appears weekly on The Paranormal Party Podcast. Anne Rzechowicz: Anne has been investigating for around 9 years. She now runs, with her husband Roman, the largest online Paranormal equipment store in Australia. Her passion for investigating has taken her around the world and she has had the opportunity to study/learn or investigate with some of the biggest names in the field: Bill Chappell, Chip Coffey, Dave Schrader, Brian Cano, The Klinge Brothers, Ciaran O'Keefe, Adam Berry, Grant Wilson, Amy Bruni, Britt Griffith, Paul Bradford, Shawn Porter, John Tenney....to name a few! She is also well known as an actress, especially her roles murdering people in Deadly Women! You are responsible for your own accommodation, airfares (where required) and transport. The fee is for the event only. Critical thinking is not a dying art :) so mark your diaries and come along to this great event were you will see me on a panel discussion as well as other fantastic speakers. ScareFest welcomes Beth Darlington to this years' Speaker Series. She will be discussing "Demonic Possession: Possible alternative explanations". Be sure to plan enough time at ScareFest to attend the seminars and workshops! This is one that you will not want to miss. Come along and meet other people equally fascinated by the paranormal. Whether you are an investigator, medium/psychic or just interested in the mystery of this great field of interest. Food can be purchased at the venue as well as drinks at your own cost. Drop in for a while or stay the whole time! Weekend of workshops, friendship, learning, "seance for the average Jo/Joe" and maybe a little bit of fun to boot! 8pm Movie Night! Something of a Paranormal/Ghost theme will be showing. Then we can discuss the validity of what we see on the screen. Workshop “I Want To Be A Paranormal Investigator” with Beth Darlington of Access Paranormal. Workshop Instrumental TransCommunication. Gadgets to communicate with the other side. Led by Roman and Anne from OzParaTech. A bit of a talk and then some practical experiments using gadgets and gizmos! “Seance For the Average Jo/Joe” No ectoplasam here! Just some good old fashioned Table Tipping, Glass Dowsing, Konxari cards and for those who dare, “Talking Boards”. Feel free to join in or sit back and watch. You will be taught to work each of these “communication tools”. Bring your own if you have any gear! We will have plenty to share too. Led by Anne, Roman, Renata and Beth. Workshop/Talk “Lets Go and Investigate My Friends house, they’ve got a demon for sure!” Haunted Houses and Private Cases. The responsibilities of being a Paranormal Investigator. Led by Anne, Renata and Beth. Question and Answer session. Led by Roman with Anne, Beth and Renata on the panel. Our Editor Sharon Ann Rowland will be interviewing Beth Darlington of Access Paranormal this Thursday evening kicking off at 6pm via Revolution Radio (www.freedomslips.com). Beth is a lively and passionate paranormal investigator. Her ambition is to provide relevant and actionable educational information for Paranormal Investigators around the globe through online learning. With her own story starting out like many others, finding information about hauntings is easy enough, but then what? Beth has Training and Development qualifications as well being a Mental Health First Aider, a student of the School of Parapsychology and over 8 years investigation experience, she also enjoys traveling around the world speaking at Paranormal Conferences. Please join us for two hours of enlightening banter! What IS the difference, if there was one? Are they truly the same? Come along to Paracon this year to hear this talk and many others over 2 days. And if your booked for the paranormal investigation either on the Friday or Saturday nights then I'll see you there too! Come along for this fabulous catch up with other people interested in all things paranormal. Drop in for one , come in for a meal or stay the whole time! Come and join the Paranormal Prospectors for a night of 5hr paranormal investigation through the old Beechworth goal . Walk the halls of this truly amazing old building with over 140 years of tales to tell . Explore the cells of Ned and Ellen Kelly, or walk the gallows where 8 men were executed. This beautiful old goal has a story to tell , why not join us to hear its tales and investigate the unknown. 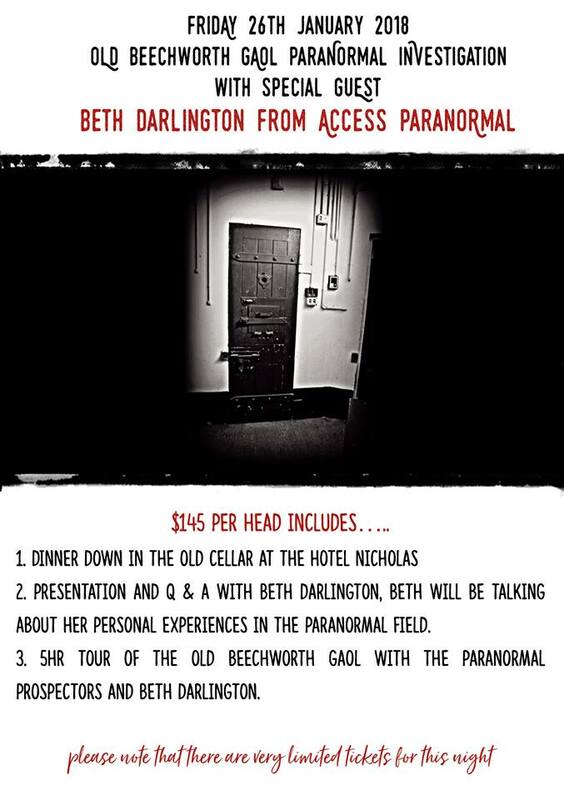 AND we are super excited to have our lovely friend Beth Darlington from Access Paranormal joining the Paranormal Prospectors as our guest speaker and investigator at THE OLD BEECHWORTH GAOL on Friday Night 26th January 2018. - Come through- the special VIP entrance, be met by your designated VIP liaison whose sole job is to cater to your needs. - Upon entry you will be laid with our exclusive lanyard so that everyone will know that to us you are royalty for the day. - Peruse the stalls and book in to see a psychic before the general public have even entered the building. - Exclusive access to a special VIP area, which will have an information desk with some nibblies and refreshments for you until stocks last. 2. Brian J. Cano paranormal investigator from the USA who was a cast member on Haunted Collector, and has starred in many other American Paranormal TV Shows. Brian is a guest speaker all around the world, and one of the best paranormal investigators you can find! 3. Beth Luscombe from Access Paranormal, Australian ghost hunter who travels all over the country, bringing people together, and also all over the world to investigate some of the creepiest locations you could ever imagine! There will also be a 'paranormal panel' - your chance to hear about the experiences REAL paranormal investigators have had in the field. There will also be SIX prizes you can win in the VIP exclusive lucky door prizes! VIP tickets are limited and selling fast, so you don't want to miss out. Get ready Perth! Calling ALL people interested in the paranormal whether you are an investigator, medium or just interested in all things spooky. Drop by from 5pm or stay a while and grab some dinner. No tickets are needed for this event - Just a relaxed catch-up with people who share an interest in the paranormal. Table booked at the Hay Street bar. Come, relax and spend the weekend at historic Quarantine Station Manly on beautiful Sydney Harbour and immerse yourself in learning about and then doing real hands-on paranormal investigation in one of Australia’s most haunted and beautiful locations! Join some of Australia’s top paranormal investigators, guides and teachers as they show you how to develop and then apply both your psychic medium-ship and hard-nosed investigative skills in a real paranormal lock-down investigation. This is a forum to bring together people interested in the paranormal for open, honest and respectful sharing of ideas and experiences. 2 nights accommodation in a Deluxe Room at Q-Station including breakfast. Be part of a real hands-on paranormal investigation of Q-Station! Guided by your guest speakers and several highly experienced and passionate paranormal investigators and psychic mediums who will be joining us for the night, put into practice the investigative skills and psychic abilities you’ve learned while using the latest equipment. We will divide you up into smaller groups of no more than 12 so there is less contamination of evidence. ROOM UPGRADES are available after purchasing your basic Deluxe/Ensuite ticket. Contact Quarantine Station direct to organise room upgrades eg Harbour View, Cottage, Retreat etc. Sticky ticket fees non refundable. Cancellation 30 - 22 days before event, 50% refund. Cancellation 21 days from event, 0% refund. Check in from 2pm Friday 21st July. Check out 1pm Sunday 23rd July, 2017. Room limits are to be strictly adhered to. For safety reasons people under the influence of alcohol or other substances will not be able to attend the tours and workshops. We reserve the right to refuse entry to workshops or tours if we feel the participant is unable to follow reasonable instructions given by the tour guide, event organisers or Q Station staff. Jim’s programs are serious discussions and are professionally produced, with regular listeners all over the globe and more than 25 million downloads to date. For more information about Jim himself, please feel free to visit his website at http://jimharold.com. Jim will be interviewing Beth Luscombe about her work with Access Paranormal and with paranormal education. Some of Jim’s past guests have included New York Times Best Seller Mary Roach, TV personality Josh Gates, Rosemary Ellen Guiley, Amy Bruni, Brad Steiger, Paranormal State’s Michelle Belanger and many, many other well-known and well-respected authors and investigators. The Business Unusual Show is a livestream interview, shared via Facebook Live, hosted by Rachel Moore. As the founder of Really Social, Rachel uses her broadcasting experience and personable style to draw out the authentic stories of leaders who run an unusual business. Viewers can interact with the broadcast by asking questions and posting comments to Rachel and the Business Unusual guests. After the livestream broadcast, Business Unusual is edited into an audio podcast which is made available via iTunes and other supporting podcast apps. Jeanette and Jen have been running successful Investigation Ghost Tours in the Campbelltown area for the past 4 years. Combining Jeanette's love of the paranormal, together with her love for history, her book 'Australia's Haunted History' has been released. Stories of ghosts and hauntings have enthralled people for centuries. From Aboriginal Dreamtime to British invasion, European settlement and beyond, all is found in this book. Join author Jeanette Kamper for an experience you won't forget in one of Campbelltown's most haunted buildings. Hear spine-chilling tales that will make you shiver ~ told by note-able Paranormal personalities, including paranormal authors, radio show hosts and Top Mediums. (For our EARLY BIRD Special tickets: $15 pp. Paranormal Experiences vs Mental Health is a session that will highlight common paranormal experiences and their similarity to mental health conditions. This session will include interactive demonstrations and case analysis and is highly recommended for those who deal with private/residential cases. Are you brave enough to join us as we explore this fascinating Court House steeped in 180 years of history? With so much history and so many souls having suffered between the walls of this building, is it any wonder there are so many ghost stories associated with it. APPI Ghost Hunts & Tours, a professional, friendly, paranormal research business, will conduct the investigation. Book early to save disappointment as there are very limited places! Would you rather just know about the history and the hauntings of Bella Vista Farm, leaving the ghost hunting to another time? Well here is your chance to join us on a ghost tour of the beautiful Bella Vista Farm. No theatrical displays, or people planted to jump out at our, APPIs ghost tours are 100% natural... We can't guarantee that you'll see a ghost, but we can guarantee that you'll have a good time! Don't travel hours to visit a truly haunted homestead! 'Bella Vista' means 'Beautiful View', so join us for a 'beautiful view' with a dark history. Join us at Bella Vista Farm and still get home before sunrise! giving you 6 Simple steps to get you on your way. Not sure if you can't make it live? No problem! A recorded version will be emailed out to you - but you gotta sign up to make sure you don't miss out! Join myself and the ever experienced Andrea Kaldy - The Paranormal Medium at this free online event. We head Down Under to talk with Aussie paranormal investigation educator Beth Luscombe of Access Paranormal on After Hours AM/America’s Most Haunted Radio, Thursdays 9-11pE with hosts Joel Sturgis and Eric Olsen. We’ll bone up on investigation tools and techniques with Beth in the 10pE hour; at 9pE, Joel and Eric will scan the week’s hot paranormal news for tasty and tantalizing tales. Informal get together for like minded individuals who LOVE all things paranormal. This evening will be Tasmania and anyone who is free is welcome to come along. Dinner will be available but at the attendees cost, just a relaxed gathering of interested people. Oz Para Tech will be running Paranormal investigator at Q Station in 2017! First one is Saturday 4th February. This will be a little different to the previous style of these events in the past. This time there will be special guest investigators and I'm honoured to be the first one! These sessions will be about trying different methods and experiments with this one about sound. What sounds trigger emotions? And do they just trigger motions of the living? Contact Q Station to book in!!!! Returning for his third year we present Bill Tabone, the founder of the Australian Paranormal Society along with his wife Amanda will be hosting the “Worlds Beyond Speakers Forum” at this year’s festival. Speakers from across Australia and the world will be gathering to present a wide variety of topics ranging from Cryptozoology, Ufology, the Occult, Paranormal, the Horror writing scene and much more. Don’t miss this spectacular event and meet some of the most brilliant people on these unusual topics early evening Friday and Saturday. For more info re the APS check out their page. This year the World’s Beyond speakers forum will be held in Gypsy Village Moon House Tent, the same space as Muffplex Cinema. Creator of Access Paranormal and Paranormal Investigator Beth has years of experience investigating the paranormal in some of the world’s most well-known locations. Passionate about the paranormal field in Australia, she created and manages the successful Access Paranormal website and has since hosted local and international guests in some of the country’s leading events. With a focus on research and education, she is a regular speaker at paranormal conferences in Australia and around the world and is the creator of popular monthly podcast "Access ParaCast". Is there a connection? How would you know the difference between a paranormal experience and a person dealing with a mental health issue? Find out in this informative talk happening at the UFO Paranormal Research Society of Australia. A Shot-Gun Start from THE SCAREFEST will kick-off hundreds of Paranormal Investigations in unison ... all over the world. On October 1, 2016, a large ensemble of ghost hunting teams will simultaneously take part in a night of paranormal investigations in the most public haunted public places throughout the nation! Called “Ghost Hunting Satellites”, these public locations and their host teams will be part of a new chapter within the paranormal field dedicated to public awareness and community unity! In this spirit, we salute and invite you to be a part of this epic event. Here's one for you! This will be a significant piece of The ScareFest and Paranormal World History. Be a part of this on October 1 at 3:15PM at the Elkhorn Room A. Join Brian J. Cano, Christopher Saint Booth, Daniel Klaes, Beth Luscombe and Maria Pons Schmidt as the panel discusses the extraordinary realm of possibilities with #TheBridge, a Paranormal Experiment, part of World's #LargestGhostHunt.